All Things Dog Blog All Things Dog Blog: Do Dogs Have Male Bonding? Do Dogs Have Male Bonding? This post is a short and sweet, very unscientific opinion on a timely and highly contested topic. Do male dogs experience male bonding the way men do? 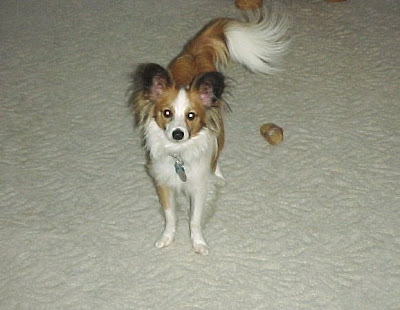 In mid-November, 2008, my mother adopted Jacque, a Papillon, from an owner who was unable to keep him. He was about 13 weeks old. His first night or two was spent at my home, where he received some of his first lessons, meals, walks and introductions to his fellow pack members. After all, dogs who belong to your extended family and will see each other often, are also a member of your pack. Training should include socializing them together from an early age. My theory is that male bonding with other male dogs in the pack will help to reduce future male-focused aggression. Each time I meet a new neighbor with a dog who will only be friendly to female dogs, I am surprised to hear this. I have always felt that if the dog were trained to accept other male dogs from an early age, the dog would follow this leadership. So, Oliver and Jacque are my guinea pigs...or research assistants? You pick. I don't care what we call them. This past weekend Jacque and Oliver had another visit. They have spent quite a few days together, playing while my mother and I catch up. Once, I kept Jacque for a few days while my mother was away, and they got a good dose of bonding during that visit. 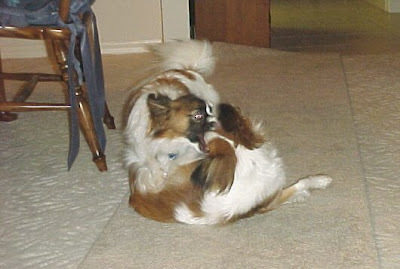 Even Tanner has enjoyed playing with his "cousin" Jacque, although Oliver has hogged most of his little companion's time. Each time Jacque and Oliver meet the scene is the same--instant Tumbleweed action. The picture below is what I call the tumbleweed; it's rather hard to tell which part of the ball of fur is Oliver and which is Jacque. 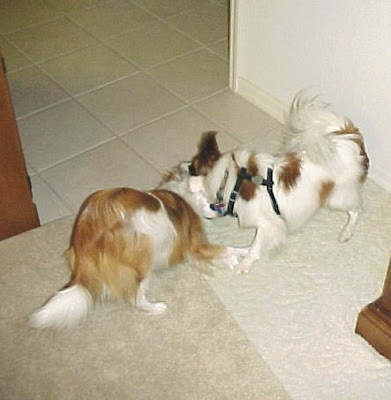 They're wrestling so intensely that you can hardly tell where one dog ends and the other begins. It is this adorable, unending enthusiasm for playing with one another that has me leaning toward a conclusion to my theory. I believe male bonding does occur in dogs. Now that I think of it, Tanner's favorite playmates, both at the dog park and his doggie daycare where he plays when I'm gone all day, are mostly (if not all) males. Perhaps there is a message in there. I'd like to study this a little further. Comments?